pavement in Big Chute, Ontario. While walking back to the camper from the Marine Railway in Big Chute, chatting casually - Rolf shouts "Stop!" mid sentence. Not realising what all the drama is about I keep on walking until he shouts it out again - "Stop!!" 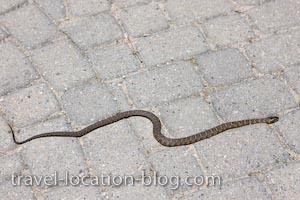 He'd seen a snake slithering across our path which could have been one of the massasauga rattle snakes - common in this region. The only problem was the apparent lack of rattle at the end of the tail. Perhaps it was a fox snake. Well, since we're not zoologists we've decided to call it a "snake" that way we're not wrong! Snake, Big Chute, Ontario, Canada.